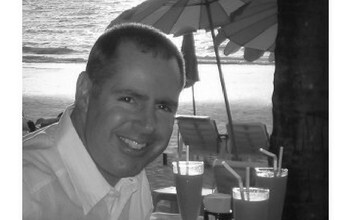 The arrival of March in Thailand signifies the start of the hot summer months. 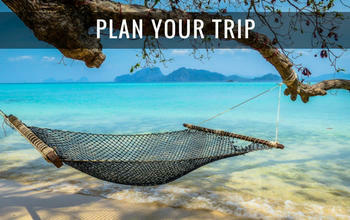 As the heat begins to build throughout March, it’s an ideal time to hit any of Thailand’s beach resorts or islands. 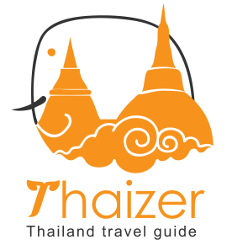 Thailand’s tourist peak season has passed by the time March arrives which means that good deals are often available on accommodation and internal flight tickets. And as an added bonus for lovers of tropical fruits, March is mango month with this delicious tropical fruit coming into its own from March-May. Most of Thailand experiences sunny, settled weather in March. Although rain showers can crop up anywhere, they are usually over quickly. Daytime and nighttime temperatures are consistently high during March. If you’re in Bangkok, try to schedule your sightseeing for earlier in the morning or late afternoon and don’t underestimate the effects of the heat. Keep hydrated and seek out the cooling confines of Bangkok’s modern shopping malls for some respite during the hottest part of the day. Even if you usually prefer fan rooms to air-conditioning, the onset of the hot season will make you thankful for air-con in your room to ensure a comfortable night’s sleep. Evening temperatures in the north of Thailand remain relatively cool, but daytime temperatures in the north and north-east do get hot during March and can take people by surprise when they discover it is as hot (and sometimes hotter) than Bangkok. Unfortunately, March is also a month which can see haze and smoke pollution in the north of Thailand. 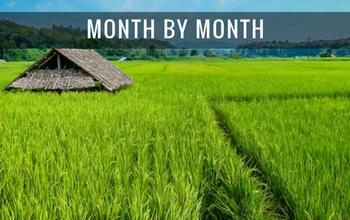 Combined with the hot, dry weather this means that the Thai countryside isn’t at its picturesque best during the month. That doesn’t mean that you shouldn’t still visit northern Thailand during March, but it’s something to keep in mind. There is an annual haze problem in the north of Thailand caused by the burning of stubble and waste in the countryside. The effects and intensity of the smog varies from year to year, but it is usually in March where there is the most potential for hazy days. If you suffer from respiratory problems it’s something to take into consideration when making your travel plans. 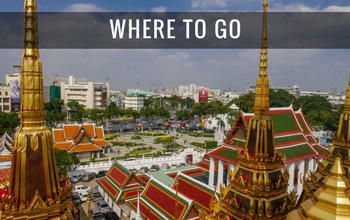 Which is the best Thai island or beach resort to visit in March? The Gulf of Thailand, the Andaman Coast and the Eastern Seaboard all see similar weather patterns during March. So wherever you choose to visit for your beach break you should experience sunny days with blue skies. There is still a chance of of an isolated rain shower, but during March the rainfall (if it does come) doesn’t usually hang around for long. Weather conditions make it an ideal month to indulge in some island hopping. On the Andaman Coast, Krabi and Phuket are excellent choices in March with a wide range of accommodation to choose from and favourable conditions at sea to visit the surrounding islands. Further south, the gorgeous Trang islands are ideal if you are looking for a relaxing retreat. Over on the other opposite coast, Hua Hin and the beaches of Prachuap Khiri Khan are solid choices at this time of the year. 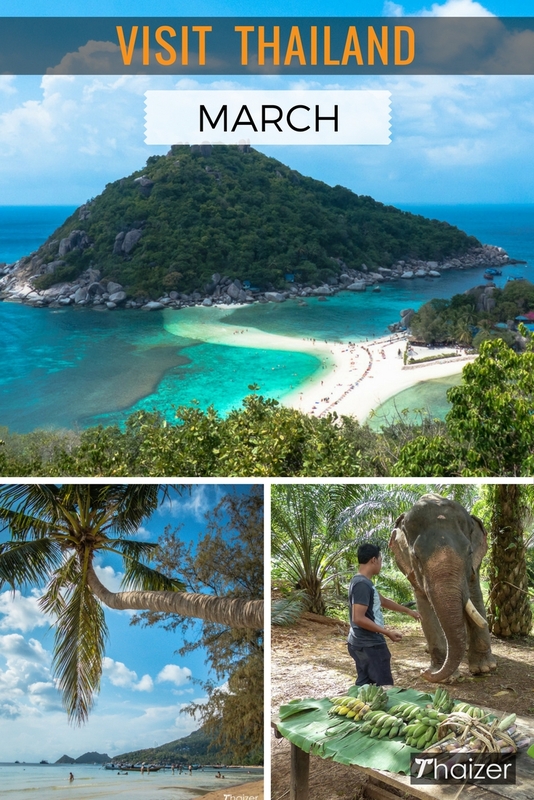 March is a good month too for visitors to enjoy the refreshing sea breezes on the trio of islands in the Gulf of Thailand: Ko Samui, Ko Pha Ngan and Ko Tao. And on Thailand’s Eastern Seaboard, you can expect fine weather in Pattaya, Ko Samet and Ko Chang. Thailand celebrates its national animal on March 13 with the day designated as National Thai Elephant Day. Various elephant sanctuaries and zoos treat their pachyderms with banquets of fruit and sugar cane to mark the occasion. Buddhist ceremonies are also held at some locations to wish the elephants and their mahouts good health and good luck. March 17 is commemorated as National Muay Thai Day. Thai boxing stadiums and gyms around the country lay on special ceremonies for the day. The biggest event is held in Ayutthaya with the city hosting the Martial Arts Festival and Wai Khru Ceremony in honour of the legendary boxer from Ayutthaya, Nai Khanom Tom. During March, seasonal winds start to pick up across the country and combined with the dry, warm weather it’s an ideal month for the traditional Thai pastime of kite flying. In Bangkok, the open spaces of Sanam Luang in front of the Grand Palace attract children and adults testing their kite flying skills. However, this year won’t be the same as usual with preparations underway at Sanam Luang to host the Royal Cremation Ceremony of His Majesty King Bhumibol Adulyadej later this year. Wherever you are in Thailand during March you may stumble upon local kite flying competitions, but the biggest organised event is in Hua Hin and Cha Am which hosts the International Kite Festival with participants from around the world joining in.